The Agriculture Law Education Initiative’s (ALEI) fourth annual Agricultural and Environmental Law Conference on Nov. 8 provided regulators, students, educators, attorneys, environmentalists, farmers, and others the opportunity to learn from experts about current agricultural and environmental legal issues affecting the region. With 116 in attendance in Annapolis, Maryland, panelists at the conference discussed a range of current legal issues facing the Maryland agriculture community and environmentalists alike. The first panel featured a discussion of the state’s Shellfish Aquaculture Leasing Program. Karl Roscher from the Maryland Department of Natural Resources and Senior Extension Agent Don Webster discussed the successes and current challenges within the program as well as available support programs for applicants. JD Blackwell, a local oyster farmer and business owner, discussed challenges experienced by growers, such as the current prohibition on leasing areas with submerged aquatic vegetation (SAV). Blackwell said an increase in SAV is one positive environmental by-product of submerged water columns. Under current regulations, the SAV that develops as a result of aquaculture operations can result in a reduction in the leased area that can be used. Extension Legal Specialist Paul Goeringer and Attorney John Dillard discussed current legal issues impacting Maryland farmers including laws regarding U.S. waterways, dicamba pesticide use, hazardous waste emissions, and reporting laws for livestock operations. Keynote speaker Senator Thomas “Mac” Middleton, a lifelong Charles County resident and farmer, emphasized the importance of trust and compromise in building policy and avoiding partisanship in Maryland politics. The event concluded with a discussion of forthcoming regulations by the Maryland Department of Agriculture (MDA) regarding the growth of industrial hemp. Vote Hemp’s Eric Steenstra discussed commercial use of hemp products and the possible inclusion of language to further legalize hemp farming in the 2018 Farm Bill. MDA’s Kevin Conroy discussed the emerging regulations and circumstances under which a farmer could legally grow hemp. Andrew Ristvey from the University of Maryland emphasized that any future hemp research by the university would be to determine the profitability of the plant for Maryland farmers. Chlorpyrifos and the Legal Landscape of Pesticide Regulation – Joshua Segal, Special Assistant to Attorney General, Office of the Attorney General, Maryland; Lindsay Thompson, Executive Director, Maryland Grain Producers Association; David Myers, Principal Agent, University of Maryland Extension, Agriculture and Natural Resources. Managing Director of the Agriculture Law Education Initiative (ALEI) at the Francis King Carey School of Law Sarah Everhart assisted in presenting a training session on the Produce Safety Rule on Nov. 7 at the Eastern Shore Hospital Center in Cambridge, Maryland. Everhart presented along with experts from the Maryland Department of Agriculture (MDA), University of Maryland Extension, and University of Delaware. The Food Safety Modernization Act (FSMA), signed into law in 2011, created an entirely new system for the prevention of foodborne illnesses. While FSMA has implemented many rules, the Produce Safety Rule impacts Maryland’s farming community the most. The Produce Safety Rule establishes science-based minimum standards for the safe growing, harvesting, packing, and holding of fruits and vegetables for human consumption. The law has various compliance dates which, depending on the size of the operation, must be understood and followed by any farmer who grows produce typically consumed raw. The law requires at least one person from each farming operation to attend a Produce Safety Rule training. Attendees gained knowledge of how foodborne illnesses are spread and what steps to take to prevent such an outbreak. The Produce Safety Rule also requires farmers to understand and document compliance in the areas of agricultural water, biological soil amendments, domesticated and wild animals, worker training, health and hygiene, and equipment, tools, and buildings. For additional resources on food safety and compliance with the law, please visit ALEI’s Food Safety Webpage, as well as ALEI’s educational videos listed under Food Safety and the Food Safety Modernization Act. Information of MDA’s upcoming FSMA trainings and resources can be accessed through this link. ALEI Legal Specialist Nicole Cook discussed Business and Legal Considerations for New and Beginning Farmers at the annual UMES Small Farms Conference on Saturday, Nov 3. Cook’s presentation covered multiple legal issues facing new and beginning farmers including choosing a business entity structure, liability insurance, lending agreements, and food safety regulations. The UMES Small Farms Conference has a beginning farmer tract as a way to provide targeted support to this community. Cook discussed how liability insurance and business entity structure can work together to provide protection for beginning farmers and their personal assets. “Much of what we do at ALEI is to help farmers identify areas of legal risk, and provide strategies to protect themselves,” Cook said. Many in attendance had not yet started their farming business. “It’s great to see that people are thinking ahead and that they are aware of important concepts. We are seeing people engaging in pre-planning, which sets them up for success,” said Cook. For additional resources for New and Beginning farmers visit the University of Maryland Extension Beginning Farmer Success Program. The Agriculture Law Education Initiative (ALEI) Advisory Panel, a body of farmers, public officials, and representatives from agricultural and natural resource organizations, gathered at the Fisherman’s Inn Restaurant in Grasonville, Maryland on Oct. 31 to review ALEI’s direction and progress. Assistant Director and Agriculture Program Leader for the University of Maryland Extension (UME) Darren Jarboe opened the meeting with a special welcome to ALEI’s newest advisory panel member, Deputy Secretary of the Maryland Department of Agriculture (MDA) Julie Oberg. In 2017, the panel suggested that ALEI focus on legal issues related to the aquaculture industry and nutrient trading, and shared suggestions on ways to promote information to farmers more effectively. At this year’s meeting, Extension Legal Specialist Nicole Cook led a presentation on the changes and programming that ALEI has implemented based on those recommendations. ALEI has been active over this past year within the Aquaculture Coordinating Council of the Department of Natural Resources and has partnered with the UME to develop more programming for the Maryland aquaculture community. The ALEI initiative also worked together to create a one-page handout of all available ALEI publications, a PowerPoint presentation for UME educators to use, and a more accessible Maryland State Bar Association (MSBA) directory for the ALEI website. The working group also shared updates and highlights from ALEI’s recent annual report. Most notably, the Initiative raised over $215,000 in funds from grants and partnerships, enabling the initiative team to deliver more outreach programs in FY 2018 across the state than ever before. Further, Extension Legal Specialist Paul Goeringer discussed the upcoming, grant-funded Farm Succession and Estate Planning workshops which the Department of Agricultural Resources and Economics (AREC) is hosting in partnership with ALEI and other entities. 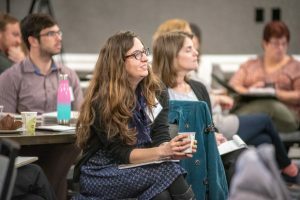 ALEI Managing Director at the Francis King Carey School of Law Sarah Everhart shared evaluation data on the grant-funded series of On-Farm Food Safety and Recall Readiness workshops she initiated last January. The data showed that after six months, 100 percent of respondents agreed or strongly agreed that they had improved the food safety on their farm operations after attending a program. The meeting concluded with an open discussion on ways ALEI can better reach Maryland’s rural communities, as well as important issues the Initiative should focus on for the upcoming year. Suggestions included changing dynamics with pesticide drift, regulations regarding temporary agricultural employment of foreign workers (H-2A), noise/nuisance complaints, right to farm issues, zoning, solar leases, and DNR lease compliance. The ALEI team has already begun to implement some of the suggestions made at the meeting and will continue to improve its programs and educational sessions.